Northwest National Real Estate: Sold! Log Home On Rock Creek! Sold! Log Home On Rock Creek! Surrounded with flowers, this quality, 3 bedroom log home and 2 car garage / shop are south of Red Lodge, Montana where Mount Maurice and Point of Rocks overlook this 1 acre lot that has Rock Creek frontage, enhanced by pine and aspen forest. Property has a surprise party deck that is situated conveniently near the kitchen for snacks and cocktails, but also near the creek and trees for communing with nature and observing animals! 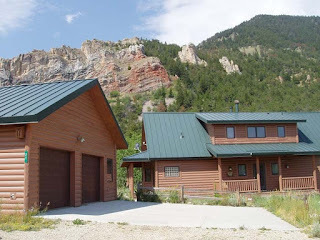 Call Red Lodge Country Real Estate at 406-446-3232 for more details. $595,000.